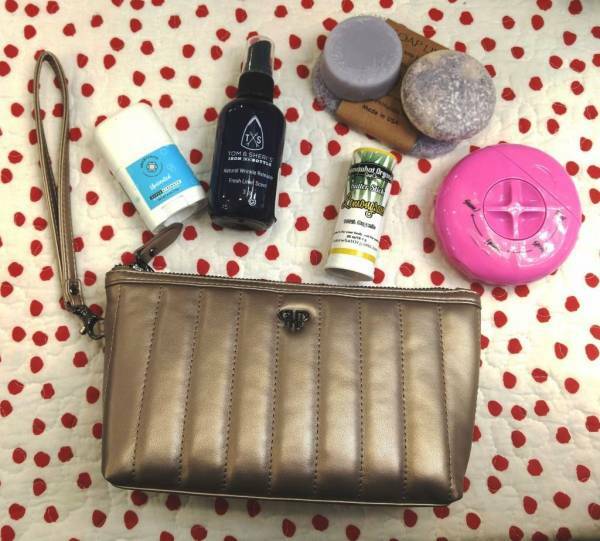 What if we told you that everything you need to shampoo and condition your hair, moisturize, shave, deodorize AND de-wrinkle your travel clothes is inside this compact travel wristlet? Not only that—most of it can stay tucked away without having to be dislodged for airport security screening. 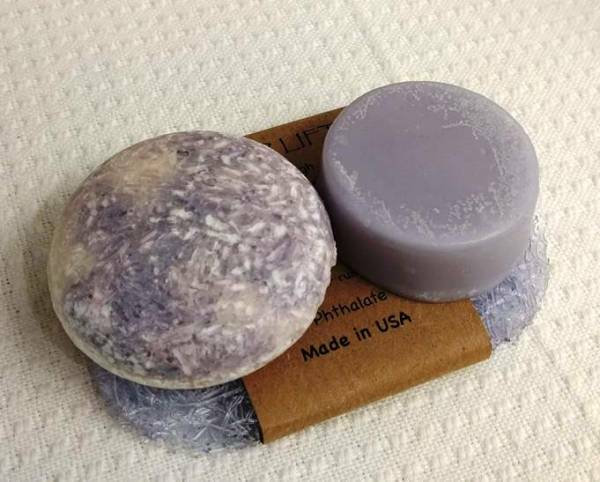 These solid shampoo and conditioner bars by The Naked Bomb are all natural with essential oils rather than perfumes or dyes. They're also good for the environment because they don't require disposable bottles like other hair products. In solid form, shampoo and conditioner bars won't have to take up any room in your quart-sized clear bag for carry-on liquids. Best of all, they'll leave your hair shiny, healthy, and smelling great. The shampoo is SLS free, so it's safe on color-treated hair and won't cause frizziness. Made in the USA. Bring along an eco-friendly bio plastic Soap Lift by Somewhat Organic—flexible and slim and easy to slip into your travel pouch. Helps your bar last longer while preventing soap residue on counter tops. Just rinse with water to clean. Made in the USA. 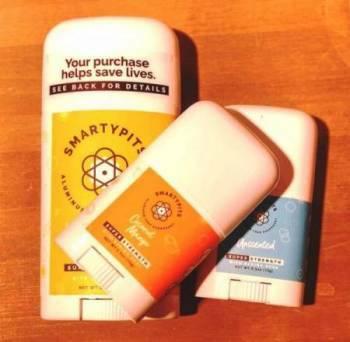 Aluminum-free deodorant by SmartyPits biologically dis"arms" the root causes of underarm odor. It comes in regular sizes and also mini sizes for traveling—or tossing into your gym bag, purse, wherever. Available in a variety of delightful scents or unscented. For every large bar sold, SmartyPits donates $.30 to breast cancer research. Most commercial antiperspirants use aluminum compounds to plug sweat glands, thus stopping perspiration. But your body needs to sweat in order to cool down and flush toxins. When the natural sweating process is blocked, your body compensates by working harder to produce more sweat or by sweating other places like your arms or back. When the inevitable sweat comes, it combines with aluminum compounds to form urea crystals, which stain your clothes. Yuck. 1) Moisture absorption and wicking. 2) Neutralization of the bacterial environment. 3) Prebiotics to strengthen your skin's microbiome. Sure, most hotel rooms come with an iron and board, but who wants to pull those out when you're on vacation? Inspired by his parents, Tom & Sheri, and his mother's ingenious homemade anti-wrinkle spray, Austin Eudaly has developed an efficient, effective, and natural Iron in a Bottle. It comes in a small 3 oz. size that won't take up much room in your clear bag for carry-on liquids—also available in larger bottles so you never have to iron again, even at home. 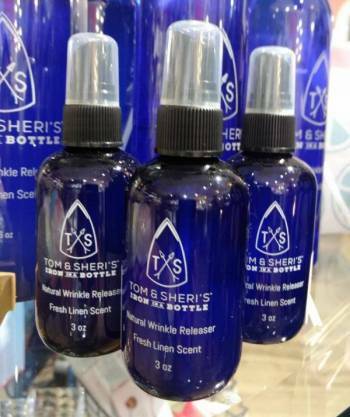 The spray is formulated without harsh chemicals to be gentle on fabrics and skin. And it smells great, too. Produced and bottled in Dallas, TX. 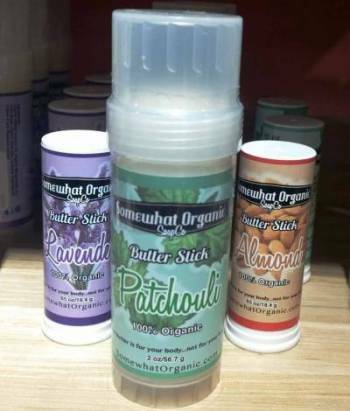 Organic body butter sticks by Somewhat Organic are loaded with naturally intense moisturizers, including coconut oil, shea butter, bees wax, and vitamin E. The solid stick is not only handy for packing and security screening, it's easy to apply without getting your hands all slippery. Butter sticks come in full and mini sizes in a variety of pleasing natural scents. 1) A tiny refillable spray bottle (keep it empty for your flight and fill with water at the hotel). 2) A moisturizing pre-shave bar with shea butter. Also rub it in as a post-shave moisturizer. 3) Two blades. One's locked and loaded and one's hidden away on standby. Just spray, lather, and shave. 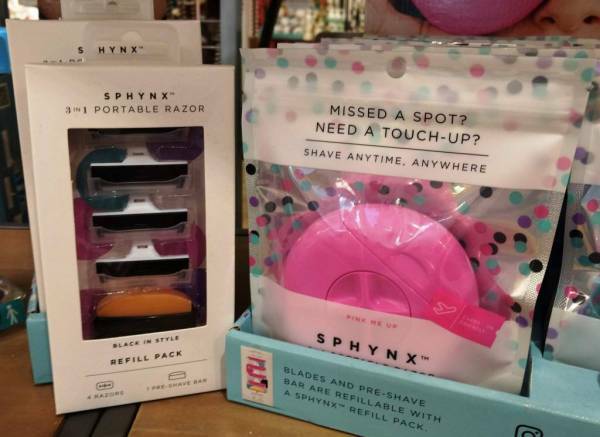 You can even pop the disk into your purse to have with you whenever you're out & about and notice you missed a spot. Houston—or Lima or Budapest or Wisconsin Dells—we have NO problem. Like we said, we can fit ALL of this into that. See? We've even got the bonus mirror included with the wristlet in there. The picture at the top of this post shows the wristlet zipped with all of these travel essentials inside. 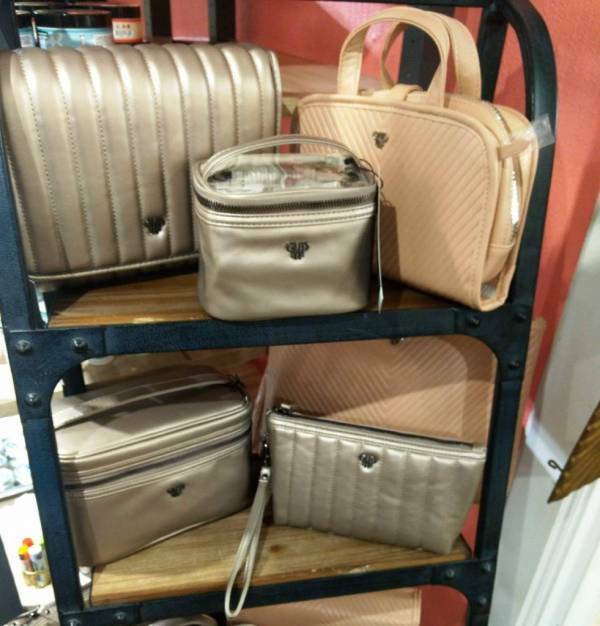 If you're looking for something a little bigger, our Bath Shop carries a whole collection of this wonderful line of travel cases by PurseN. 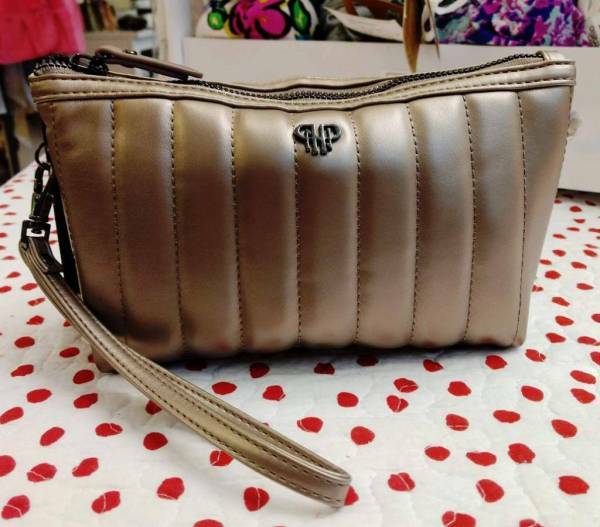 Designed by a busy mom to provide luxurious organization for mutli-tasking women on-the-go.